There will be only one (last) round of the Regular Season in Liga Femenina. The most interesting game was a derby match between two local teams from Santiago: Boston College (#4) and Sergio Ceppi (#6). Sergio Ceppi was smashed at home by 16 points 61-77 and even the fact of playing on their own court did not help. Boston College outrebounded Sergio Ceppi 51-35 including a 18-6 advantage in offensive rebounds. Cuban center Arlenys Gonzalez (185-87) orchestrated the victory with a double-double by scoring 14 points and 17 rebounds. The former international guard Venecia Castaneda (-84) contributed with 17 points and 4 assists for the winners. Kasandra Espinoza replied with a double-double by scoring 12 points and 12 rebounds for Sergio Ceppi. Sergio Ceppi's coach rotated ten players seeing no chance for a win. Boston College maintains fourth position with 8-4 record. Sergio Ceppi at the other side keeps the sixth place with ten games lost. Boston College are looking forward to face higher ranked New Crusaders (#3) in Valpara�so in the next round and it may be the game of the week. Sergio Ceppi will have a break next round. Liga Femenina top team - Sportiva Ita. (11-1) had no problems winning another game. This time they beat fifth ranked Brisas (5-9) in Santiago 71-54. Narlyn Mosquera scored 18 points, 7 rebounds and 4 assists to lead the charge for the winners and Fabiola Pardo chipped in 10 points, 8 rebounds, 5 assists and 6 steals during the contest. Sportiva Ita. 's coach allowed to play the deep bench players saving starting five for next games. International forward Francisca Rojas (176-93, college: Boston Coll.) responded with a double-double by scoring 15 points, 11 rebounds and 5 assists. Sportiva Ita. have a solid three-game winning streak. They maintain first position with 11-1 record. Brisas lost third consecutive game. They keep the fifth place with nine games lost. Sportiva Ita. will play against New Crusaders (#3) in Valpara�so in the next round, which may be the game of the day. Brisas will have a break next round. The game in San Fernando supposed to be also quite interesting. Third ranked Univ.de Chile (10-4) played at the court of 7th ranked Libertad SF (2-11). Univ.de Chile smashed Libertad SF 80-55 on Sunday. Catalina Lopez notched a double-double by scoring 15 points and 19 rebounds to lead the effort. Even a double-double of 17 points and 13 rebounds by Paola Naranjo did not help to save the game for Libertad SF. The winner was already known earlier in the game, so both coaches allowed to play the bench players saving starting five for next games. Univ.de Chile moved-up to second place. Libertad SF lost fourth consecutive game. They keep the seventh position with 11 games lost. Univ.de Chile will have a break next round, and it should allow them to practice more before next game. Libertad SF will play against Univ.de Los Lagos (#8) and it may be a tough game between close rivals. Liga Femenina top team - Sportiva Ita. (11-1) had no problems winning another game. This time they beat fifth ranked Brisas (5-9) in Santiago 71-54. The game without a history. Sportiva Ita. led from the first minutes and controlled entire game increasing their lead in each quarter. They dominated down low during the game scoring 50 of its points in the paint compared to Brisas' 26. Sportiva Ita. forced 20 Brisas turnovers. Narlyn Mosquera scored 18 points, 7 rebounds and 4 assists to lead the charge for the winners and the former international guard Fabiola Pardo (165-76) chipped in 10 points, 8 rebounds, 5 assists and 6 steals during the contest. Four Sportiva Ita. players scored in double figures. Sportiva Ita. 's coach allowed to play the deep bench players saving starting five for next games. International forward Francisca Rojas (176-93, college: Boston Coll.) responded with a double-double by scoring 15 points, 11 rebounds and 5 assists and Jessica Webar scored 16 points and 5 rebounds (on 6-of-7 shooting from the field). Sportiva Ita. have a solid three-game winning streak. They maintain first position with 11-1 record. Brisas lost third consecutive game. They keep the fifth place with nine games lost. Sportiva Ita. will play against New Crusaders (#3) in Valpara�so in the next round, which may be the game of the day. Brisas will have a break next round. The most interesting game was a derby match between two local teams from Santiago: Boston College (#4) and Sergio Ceppi (#6). Sergio Ceppi was smashed at home by 16 points 61-77 and even the fact of playing on their own court did not help. Boston College outrebounded Sergio Ceppi 51-35 including a 18-6 advantage in offensive rebounds. Cuban center Arlenys Gonzalez (185-87) orchestrated the victory with a double-double by scoring 14 points and 17 rebounds. 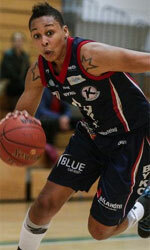 The former international guard Venecia Castaneda (-84) contributed with 17 points and 4 assists for the winners. Kasandra Espinoza replied with a double-double by scoring 12 points and 12 rebounds and international guard Angella Angotzi (171-86) added 12 points and 5 rebounds in the effort for Sergio Ceppi. Sergio Ceppi's coach rotated ten players seeing no chance for a win. Boston College maintains fourth position with 8-4 record. Sergio Ceppi at the other side keeps the sixth place with ten games lost. Boston College are looking forward to face higher ranked New Crusaders (#3) in Valpara�so in the next round and it may be the game of the week. Sergio Ceppi will have a break next round. The game in San Fernando supposed to be also quite interesting. Third ranked Univ.de Chile (10-4) played at the court of 7th ranked Libertad SF (2-11). Univ.de Chile smashed Libertad SF 80-55 on Sunday. Univ.de Chile held Libertad SF to an opponent 25.0 percent shooting from the field compared to 45.1 percent accuracy of the winners. Univ.de Chile looked well-organized offensively handing out 21 assists. The former international center Catalina Lopez (184-84) notched a double-double by scoring 15 points and 19 rebounds to lead the effort and the former international guard Paula Moya (174-90) supported her with 23 points, 6 rebounds and 5 assists. Even a double-double of 17 points and 13 rebounds by the former international forward Paola Naranjo (183-78) did not help to save the game for Libertad SF. Tatiana Moyano added 13 points, 5 rebounds, 6 assists and 4 steals for the hosts. Four Libertad SF players scored in double figures. The winner was already known earlier in the game, so both coaches allowed to play the bench players saving starting five for next games. Univ.de Chile moved-up to second place. Libertad SF lost fourth consecutive game. They keep the seventh position with 11 games lost. Univ.de Chile will have a break next round, and it should allow them to practice more before next game. Libertad SF will play against Univ.de Los Lagos (#8) and it may be a tough game between close rivals. Los Leones overcame Madre Paulina to advance into the semifinal stage. Los Leones outrebounded Madre Paulina 52-35 including a 40-25 advantage in defensive rebounds. The best player for the winners was American power forward Carmen Tyson-Thomas (180-91, college: Syracuse, agency: Two Points) who had a double-double by scoring 24 points, 19 rebounds and 5 assists. The former international forward Paola Naranjo (183-78) chipped in a double-double by scoring 11 points and 16 rebounds. Los Leones' coach used a ten-player rotation which allowed the starters a little rest for the next games. Argentinian Daniela Gomez (-85) produced a double-double by scoring 19 points and 13 rebounds and the former international point guard Pia Soto (170-95) added 22 points respectively for the hosts.